Like most Catholics, I woke on the morning of Feb. 11, 2013, to a different sort of alarm. Nothing in my past — indeed, very little in history — had prepared me for what I found in the news that day. To many people, the Pope resigning seemed an impossibility, like a square circle. But that wasn’t my particular problem. As a theologian, I knew it could be done. In fact, the conditions had been publicly rehearsed by no less an authority than Benedict XVI in interviews with the media. A pope’s resignation was not my problem. My problem was with this Pope resigning. He has been part of my life since early in my adulthood. I discovered Joseph Ratzinger’s work while I was still a Presbyterian minister. His books were a secret pleasure, and they showed me (and later my wife, Kimberly) the way home to Rome. As a Catholic, I was profoundly influenced by his biblical theology and his use of “covenant” as an interpretive key to unlock the mysteries of faith and the secrets of Scripture. I’ve written many books, but few authorial moments have pleased me so much as the day I presented the Holy Father with a copy of my book Covenant and Communion: The Biblical Theology of Pope Benedict XVI. On the morning of Feb. 11, and well into the evening, I found almost unbearable the thought of this man fading from my life. And I felt this, I believe, in communion with millions of Catholics. He has always been there for us. He has always been present. At the Second Vatican Council, he was there, and he played an active role, not as a bishop, but as an expert adviser to one of Europe’s most influential bishops. Young Joseph Ratzinger played an important role in the drafting of two key Council documents. Through the 1960s, he was present as one of the world’s leading theologians. It was Joseph Ratzinger who emerged as the most articulate voice of the authentic teaching of the Council. He never tried to steal the spotlight, but he was always there for us. As a professor, he was there for his students, too. He was a theologian who raised up a generation of brilliant theologians. And he has remained a fatherly presence in their lives, extending his influence through their work and now through the work of their students as well. It was a life he loved, but he gave it up when Pope Paul VI called him to be a bishop and then created him a cardinal. While he had been a powerful presence to his fellow theologians, in the 1970s and 1980s, he became a universal Churchman — a presence for the whole Church, speaking plain sense at a time when nonsense abounded. He was there for all of us, speaking up, with the gentleness of true authority. 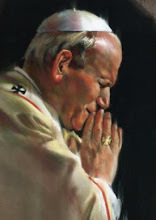 He was always there for Blessed John Paul II. He was that pope’s most trusted adviser and his dear friend. Repeatedly, the Polish Pope refused the German cardinal’s resignation. When John Paul went to glory, the identity of his successor seemed self-evident to the cardinals who met in conclave. Since then, Pope Benedict has been a presence in the world — a witness, a judge, a counselor. A father. Our Holy Father. When I awoke on Feb. 11, the thought that he would no longer be there seemed unbearable. Yet he will be there. It’s not as if he’s retiring to the Cayman Islands to avoid the taxman. He’s retiring to a monastery to give the rest of his days to prayer — for us. For you and me. As a theologian, I have a certain reverence for theology — the science of sciences, the science of God — and so I respect Pope Benedict’s accomplishments in the field we share. As a Catholic, I honor the office of bishop as I should honor the persons of the apostles themselves. How can I begrudge the man his decisive movement into the contemplative life, which is an anticipation of the life of heaven? He will be there for us. He will be there for me. I know what we’ll all be giving up for Lent this year. Yet I know it will be our gain. On April 29, 2009, Pope Benedict XVI did something rather striking, but that went largely unnoticed. He stopped at the town of L’Aquila, which had been struck recently with a bad earthquake, and visited the tomb of an obscure medieval pope named St. Celestine V (1215-1296). But the Pope did much more than say a brief perfunctory prayer. Without a word of explanation, after several minutes of prayer, he removed his pallium from around his shoulders and placed it gently on Celestine’s glass-encased tomb. A pallium is a sacred garment, like a long, stiff scarf, which happens to be the primary symbol of the pope’s episcopal authority as bishop of Rome. And he left it atop Celestine’s tomb. 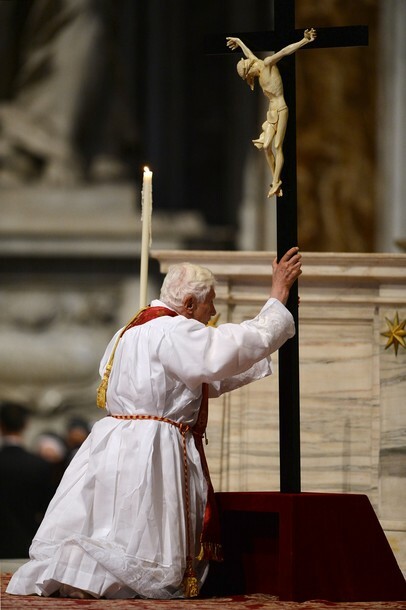 Fifteen months later, on July 4, 2010, Benedict went out of his way again, this time to visit and pray in the cathedral of Sulmona, near Rome, before the relics of this same saint, Pope Celestine V.
Only now, we may be gaining a better understanding of what it meant. Both acts were more than pious gestures. More likely, they were profound and symbolic actions of a very personal nature, which conveyed a message that a pope can hardly deliver any other way. Just five months later, after issuing a formal decree allowing popes to resign (or abdicate, like other rulers), Pope Celestine V exercised that right. And now Pope Benedict XVI has chosen to follow in the footsteps of this saint. Celestine didn’t resign because he was a saint. He wasn’t a saint because he resigned. He resigned to become a saint.